What is a gojo and why do I want one? Many people who are learning to kiteboard will tell you, that it is sometimes difficult to keep track of their boards, and sometimes their boards are difficult to get back to after a wipeout. This experience is common to all newbie kiters, but eventually they get the skills to be able to body drag upwind back to their boards, and also hopefully fall off less. 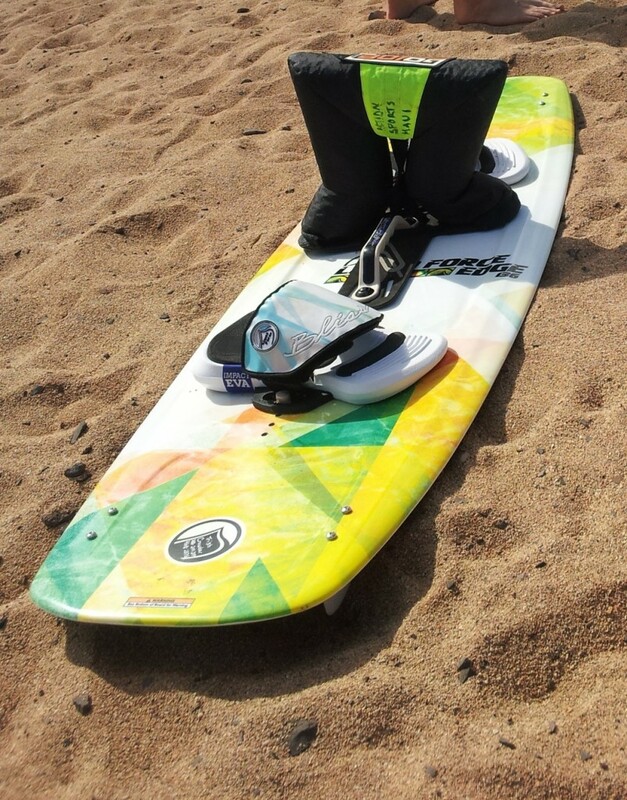 When a kiter starts to ride their boards they usually are only attached to the board with the footstraps. The footstraps give the rider the ability to control the board and stay connected even in a jump. But when a kiter eventually falls, (and they all do eventually), then they must be able to come out of the straps, to avoid an ankle injury. So when a beginner is learning to ride a board, they invariably fall a lot. So they spend a lot of time trying to get their board back. Or trying to get back to where they left their boards. Usually wipeouts will occur when a kiter loses control of the kite momentarily, like with a sudden unexpected power surge. This means that they are often dragged along in the water for some distance until they gain control or release the bar. What often happens is the board has come off somewhere along the way. Many people who ski can relate to the “yard sale” where their gear is strewn across the ski slope after after an ignomious dismount. The same thing happens in kiting, but it is usually the board that gets “yarded” and left behind. Generally beginners will spend a little time getting their kite back up an get themselves sorted out, before they start looking for their boards. This could be a minute or two before they start looking for the board, and before they can start getting back to their boards. Often the board is left in an upwind position from the kiter. This makes the board harder to get to because beginners are usually not very good at getting upwind. The board will generally float down-wind eventually, but often the kiter is still getting dragged in the same downwind direction, and cant quite reconnect with their board before they run our of time. Also there is a problem of when the board flips upside down it becomes very hard to see. The typical twin-tip kiteboard has only small 2-3 inch fins, which will be all that is visible if the board is inverted. This makes the board very hard to see especially in choppy water. The obvious solution was to tie the board onto the rider’s leg with a leash, but this proved to be far too dangerous, and there were too many accidents resulting from the use of kiteboard leashes. So some clever people came up with a solution to all of these problems called the “Go-jo”. The Go-jo is a clever device that looks like a boot attached to the board. The Go-jo is a device that you can buy and attach to the board using the handle screws. The device is inflated with a kite pump, and makes a semi rigid “sail” that sticks out from the deck (top) of the board, in between the rider’s feet. The go-go works in two ways. 1) when the board is flipped upside down, it rights the board, and flips it up, so it is easier to see. And 2) the Go-jo acts like a sail, and helps the wind push the board faster downwind to where the rider can get to it easily. This little device is safe too, because it does not attach the board to the rider. The Go-Jo is now started appearing in more places, and is used and recommended by many kite schools and kiteboarding instructors. These little gadgets can be a life saver and a board saver. So if you are at that stage of needing a little help getting back to your board, why not try one of these helpful little gizmos. Some shops are happy to rent you one, or sell you one. They Go-jo sells for about $79.00 dollars, so it is a cheap investment to ensure that you don’t lose your board. Warning- Don’t use board leashes: And for those skeptics our there that may be tempted to use an old surfboard leash, please don’t. Most kiteboarding schools and organizations have banned the use of board leashes because of the many known dangers. If you thinking about using a leash or know someone who use’s a kiteboard leash you might want to refer them to a gnarly and gruesome website called www.kiteboardleash.com, but beware the images are quite disturbing.